We didn’t eat the cupcakes in the order that I’ll review them in, we kinda jumped all over the place. But for your sanity, I’ll group them by bakery. First up, Sweet Bakery now located in Midtown Baltimore. 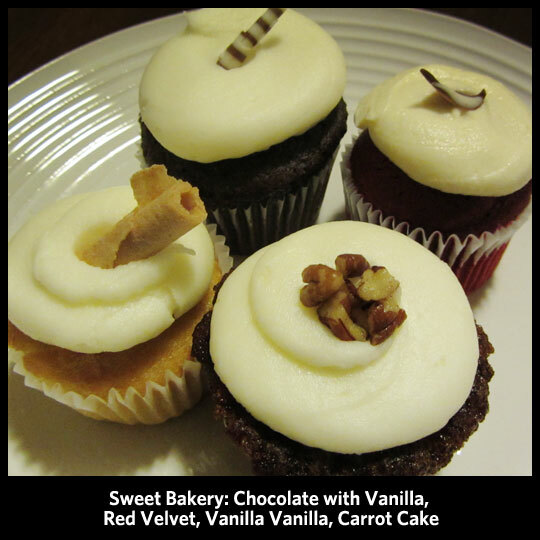 My first experience with Sweet Bakery was when they were located on Main Street in Ellicott City and it was a good experience so I was excited to try more of their cupcakes. Chocolate w/ Vanilla Frosting: Their vanilla frosting is really good. Buttery and not too sweet, just sweet enough. The chocolate cake though? Meh. Not great. Elisa and I both agreed that Betty Crocker makes a better chocolate cake. Red Velvet w/ Cream Cheese Frosting: This was easily probably the best red velvet cake Elisa or I ever had. It was soft, moist, fluffy, wonderful. The cream cheese frosting was amazing too. Sweet, but like the vanilla frosting, not too sweet. It was a perfect compliment to the red velvet cake. Vanilla w/ Vanilla Frosting: I typically don’t get Vanilla on Vanilla. With all the unique options out there I usually go for something different, but this was actually really good. Especially with all the other bold flavors we were trying, it was a nice “break” from the others. I would definitely get this one again, and I never thought I’d ever order a vanilla cupcake on my own. Elisa loves vanilla and said she thinks it’s the best vanilla cake she’s ever had. Carrot Cake w/ Vanilla Frosting: Well… this one was such a disappointment. I’m so sad to say that because we saved this one for last because I LOVE carrot cake. The first big problem for me was the frosting. I’m a fan of cream cheese frosting with my carrot cake. And their cream cheese frosting was so good that it was a shame they didn’t put it on this one. Another big problem was that the cake was super chunky and super dry. While I like a lot of “stuff” in my carrot cake, this was just extreme. This cupcake was definitely the loser of the evening. You are probably questioning my cupcake tasting experience at this point, right? Well, shocked as you may be, Roland Park Bagel Co. was on Baltimore Magazine’s top ten best cupcakes in Baltimore, so we had to try them. We were pleasantly surprised by the fluffy softness and flavor of these cupcakes. Cookies N Creme: Okay, first and foremost, I need to state that in my opinion, THIS IS NOT A COOKIES N CREME CUPCAKE! That said, it was still delicious. The frosting was cream cheese, which while it’s not appropriate for Cookies N Creme, it was light, fluffy, and very tasty. The chocolate cake was the same. No complaints other than, this is totally not a Cookies N Creme Cupcake. Elisa, however, liked it better than her recent experience with a Cookies N Creme cupcake she tried in Atlantic City (she will be giving me a review to post about that at a later date). Chocolate w/ Salted Caramel Frosting: The person behind the counter told me this was a black bottom cake with a caramel frosting. What he didn’t say was that it as SALTED caramel and that the cake was really just chocolate cake with a speck of possible “black bottom-ness.” Either way, this was a favorite of the night. Like the “Cookies N Creme” the cake was light and fluffy. The frosting was the perfect combo of sweet and salty. Elisa and I are both really digging the recent salted caramel trend. We never seem to grow tired of it. Peanut Butter Chocolate: I think the most important thing to mention about this cupcake is that the cake is more like a muffin than a cupcake. It’s very dense, not too sweet and a little on the dry side. However, the peanut butter frosting on this is unbelievably amazing. And to top it off they actually spread a layer of crunchy peanut butter under the frosting. So, even if it is more muffin like, it’s really really good. Coconut: Really, there isn’t much to say about this one other than: unmemorable. I had totally forgotten what I thought of it and had to look back at my notes (yes, we took notes…). That night we said, “more muffin like” and “more like a breakfast cupcake.” If those things sound appealing to you, then this is your cupcake. Otherwise, don’t bother. 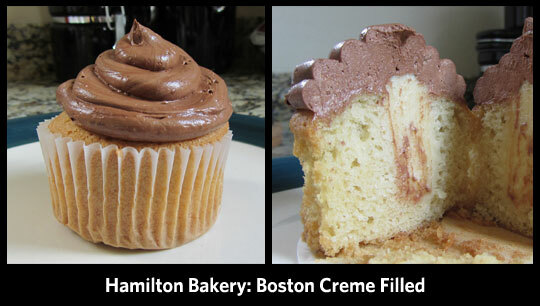 I actually “cheated” on Elisa’s and my “Cupcake Night” by getting a cupcake from Hamilton Bakery a few days before. I figured I could wrap that up into this post. I went by their location and saw that they had a Boston Creme cupcake and knew that it probably wouldn’t be there the next day, so I decided to get it. The cake was the same as above, very muffin like, and the frosting was just kinda blah. Not my favorite. I might try more cupcakes from them, but I’m more excited to try their breads and other pastries. Those look amazing. If you have tried cupcakes from any of these locations I’d love to know your thoughts! EDIT: Sweet Bakery is now, sadly, closed. This entry was posted in Baltimore, Cupcakes, Maryland and tagged boston creme, Caramel, carrot cake, Chocolate, closing, coconut, cookies and creme, Hamilton Bakery, peanut butter chocolate, Red Velvet, Roland Park Bagel Co., Sweet Bakery, vanilla by Stacy. Bookmark the permalink. Luckily I’ve never had grainy cream cheese frosting. Ew! I think I’d have to spit it out. 😉 How is the Red Velvet coming along. I’ve never tried making it, but I’ve heard it’s tough, and it’s really hard to find a bakery that does a decent one. And now I’ve stumbled upon your blog, and am hooked! CUPCAKES! Hello Cupcake Crusaders! Maybe one day you can critique one my cupcake recipes. Since I’m pretty new to this whole blogging thing, I have only posted one cupcake recipe so far. I really enjoy your blog and have been to those DC cupcake joints you have listed under favorite bakeries and cupcakeries. Not sure why I’m just reading this now! I thought I had and just went over it and straight to comments. But, now that I’ve read it I have to comment since I also tried all the cupcakes (thanks for sending the leftovers my way!). There are just a couple of cupcakes that I disagree with you on. First being the carrot cake from Sweet Bakery Elisa and I both agreed that we really like it. It’s chunky and that makes it different from a lot of other carrot cakes. And, I like it like that! 🙂 But, a cream cheese frosting would have made it better. You are right about that. 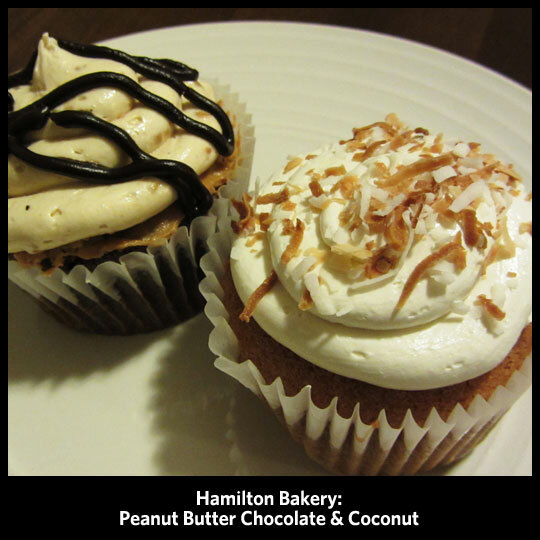 Second, I really enjoyed the coconut cupcake from Hamilton. But, I love coconut. I also liked their boston cream and their peanut butter. I agree that the cake is different, but I wouldn’t call it dry. I don’t think it’s really muffin like either…it is hard to describe. But, I’d go there again. I do agree that it’s not #2, though. Maybe I wasn’t as picky about these 3 because they all have an element of something I love? I should probably just try plain chocolate or vanilla.